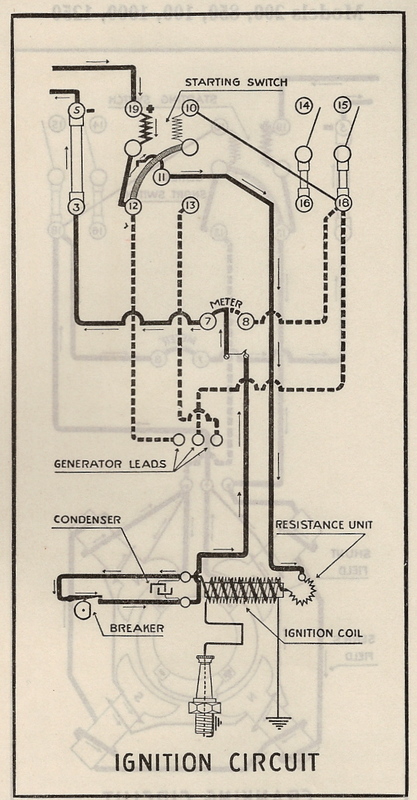 NOTE: On some 850 and 1250 plants the ignition lead from #11 will connect to the ignition coil terminal nearest the draft tube and the meter contact lead will connect to the resistance unit. 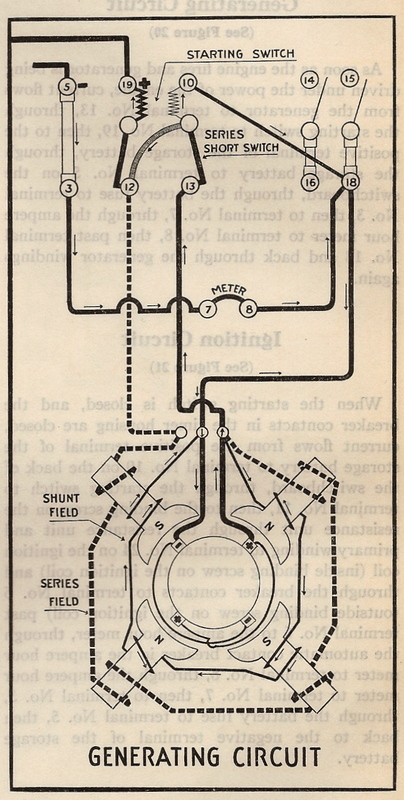 When the lever on the starting switch is pulled up firmly, current flows from the positive terminal of the storage battery to terminal #19 on the switchboard, through the starting switch to terminal #12, and then through the wire that leads to the generator, through the generator to terminal #18 on the switchboard, past terminal #18 to terminal #8 through the ampere hour meter to terminal #7, then to terminal #3, through the battery fuse to terminal #5, and back to the negative terminal of the storage battery. 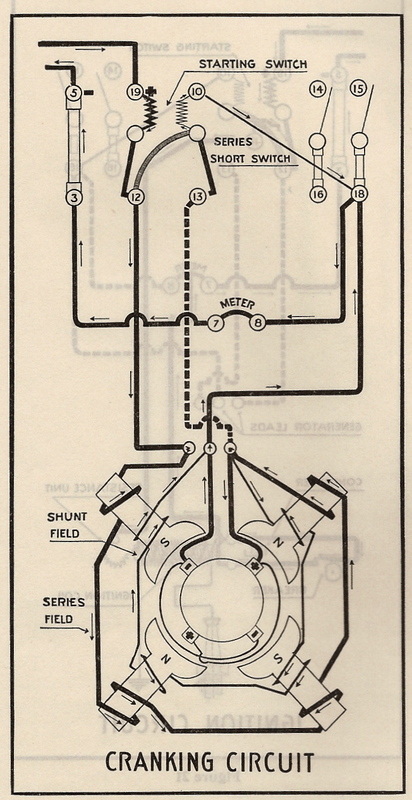 As soon as the engine fires and generator is being driven under the power of the engine, current flows from the generator to terminal #13, through the starting switch to terminal #19, then to the positive terminal of the storage battery, through the storage battery to terminal #5 on the switchboard, through the battery fuse to terminal #3, then to terminal #7, through the ampere hour meter to terminal #8, then past terminal #18 and back through the generator windings again. 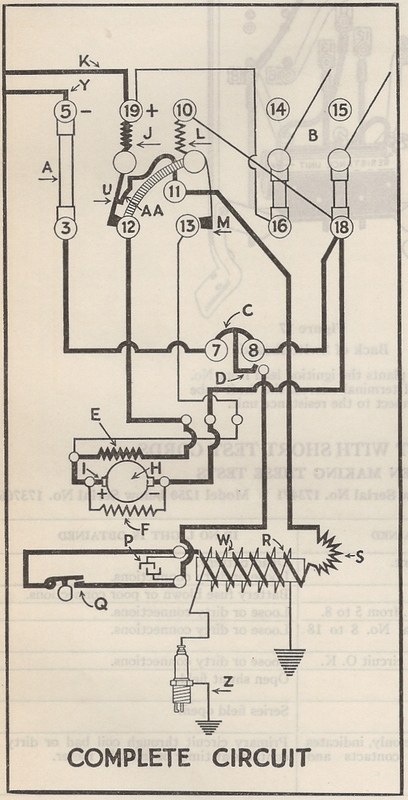 When the starting switch is closed, and the breaker contacts in the timer housing are closed, current flows from the positive terminal of the storage battery to terminal #19 on the back of the switchboard, through the starting switch to terminal #11, then to the binding screw on the resistance unit through the resistance unit and primary winding to terminal #24 on the ignition coil (inside binding screw on the ignition coil) and through the breaker contacts to terminal #6 (outside binding screw on the ignition coil) past terminal #6 to the ampere hour meter, through the automatic contact breaker in the ampere hour meter to terminal #8, through the ampere hour meter to terminal #7, then to terminal #3, through the battery fuse to terminal #5, then back to the negative terminal of the storage battery.